Please place us on your list,you won't be disappointed. The first thing you should take care when you are looking for quality vendor is If your seller is selling you the different countries hair which is chemically processed Chinese hair and being sold as Brazilian, Malaysian, Cambodian, Peruvian, Russian, Mink Hair or any other countries hair, JUST AVOID THEM. Why you are buying all above different countries hair from China instead of Brazil, Peru or Russia? Even dealing with quality and genuine vendor is also not that easy, People spend a lot of bucks just to make sure they have got their desired quality Raw Indian Hair Vendor and a company whom they can trust for their brand value with award winning customer support. If you are really looking for the same quality hair and genuine Raw Indian Hair Vendor with affordable prices direct from India Please get in touch with us. You will have the 100% Guaranteed quality Raw Indian Hair Wefts, Clip-Ins, Swiss Lace Closures and Frontals, Bulk Braiding Hair, Ponytails. #We don't sell the different countries hair which is chemically processed and being sold as Brazilian, Malaysian, Cambodian, Peruvian, Russian, Mink Hair or any other countries hair. Payment methods accepted : PayPal <Proudly>, Western Union, Moneygram and Bank Wire for large orders. **We are not associated any other company, we have our own factory here in Southern Part of India where we do hair processing ie stitching, grading, packaging. 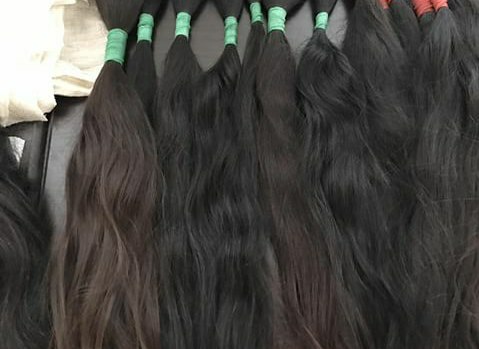 We do supply quality unprocessed Raw Indian Hair to a lot of brands, salons and wholesalers there in states. Your most welcome to visit our factory 24x7 on Facetime, Skype or Personal Visit. Virgin hair - this is the type of hair of the highest quality, which is increasingly rare to find in our time. Hair of this type has not been previously subjected to any chemical treatment, and these hair have a good structure and structure. They can be freely painted, plus they are durable. These hair are of excellent quality, soft, silky without split ends. Man BHM ain't what it used to be. You can say that again. It's like a flea market now. Can the mods do something about that?